Almost all computers give you the basic information that most cyclists want: current speed, trip distance, ride time, and total distance (odometer). Most also tell you your average and maximum speed for your current ride, and the time of day, and many also give you a second trip distance display, so that you can, for example, remember the mileage at some intermediate point during your ride. There will be a "reset" function that you use at the beginning of each ride to refresh your trip distance, average speed, and maximum speed, but your odometer total will be kept for all rides (until you have to change the battery). Basic models cost $30-$40, and consist of a computer head unit on your handlebar, a wire that runs down to a sensor on your fork, and a spoke magnet that rotates around the sensor. Models: Cat Eye Enduro 8 and Cat Eye Strada. A basic wireless computer provides the same information, but the installation is easier and cleaner-looking, because the wire between the head and the sensor is eliminated. The sensor unit will be slightly larger compared to a wired model, because the sensor must also contain a transmitter and its own battery. Models: Cat Eye Micro Wireless ($59.99) and Cat Eye Strada Wireless ($62.99). "Cadence" refers to the speed of your pedaling, measured in rotations per minute (RPMs), rather than your actual speed of travel; many people want this feature for more advanced fitness and training programs. Computers with this feature have an additional magnet and sensor that connects to one of your bike's crank arms. Models: Cat Eye Strada Cadence ($44.99) and Cat Eye Strada Double Wireless ($99.99). Other advanced features: Dual-bike settings, temperature, and rear wheel speed sensor. The dual-bike setting allows the computer to store two calibration settings so that you can move the computer head from one bike to another, so that you don't have to buy a whole new unit if you have a second bicycle. You just have to purchase a second mounting kit to match your computer model. Not many models of computers have a thermometer, but one of the few that does is the Cat Eye Commuter ($69.99), which also has other unique features, such as trip ETA and carbon emission offset tracking. A rear-wheel speed sensor is useful if you use your bicycle on an indoor trainer and still want to be able to see your speed and distance. The Cat Eye Strada Cadence and Cat Eye Strada Double Wireless have this feature. For the ultimate in flexibility, portability, and route-tracking features, check out one of the many GPS-enabled bike computers. These provide many of the same benefits as auto-based GPS systems, such as the ability to display your position on a live map; backtrack on your route; find restaurants, parks, and other destinations; and uploading your ride data to your personal computer for review and analysis later. Smaller bike GPS units don't display a map on their screens, but allow you to view the map when you upload it to your PC. GPS-based units can also more easily be transferred from one bicycle to another, without the need for bike-specific calibration. 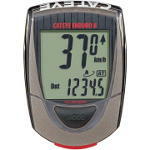 Garmin manufactures a full range of bike-specific GPS units. Stop in and chat with the experts at any Century Cycles store if you would like to discuss your personal cycling data-tracking needs in more detail. Of course, our experts can install any of these devices on your bike for a nominal charge.